Take maida, salt and oil in a wide bowl. Mix all these ingredients and finely rub it (maida n oil) with your fingers, then add nigella seeds. Add water and make a smooth (semi-soft) dough. Cover the dough with a wet muslin cloth. Heat oil in a pan. Add cumin seeds, hing, grated ginger, green chilly and saute for a while. Add the crushed moong dal and mix it well. Saute for a while, when the moisture evaporate and the mixture should dry add the fennel seed powder, haldi, garam masala, amchur powder and mix it. Adjust salt as per your taste. Fry for more 3-5 mins and remove from flame. Keep aside and let it cool. Now, divide the dough into equal size. 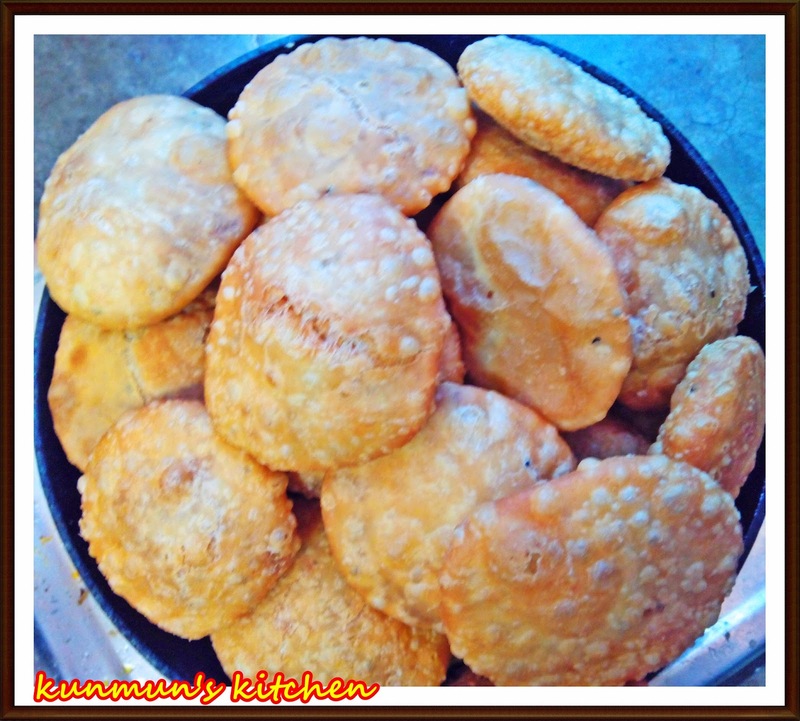 Roll out the dough into little poori shape, put 1 tsp filling in the middle and cover it from all sides. Seal the ends tightly. Then roll it just make kachodi shape or you can gently press it with your thumb. Heat enough oil in a kadhai and deep fry the kachodi in a low-medium flame till golden in colour. It takes a more time to fry. So don't worry, cook it properly both the sides. Remove kachodis from oil and place on absorbent paper to soak excess oil. Now its ready...Serve your Kachodis with any green chutney or curry.